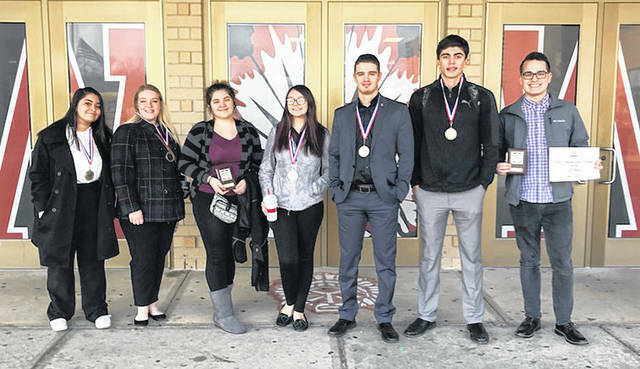 Pictured left to right are Wayne High School Business Professionals of America membes Tacenanna Zeleya, Faith Bastress, Daisy Gibb, Destiny Wagoner, Caleb Pequignot, Bobby Cole and Matt Stuart. HUBER HEIGHTS — Congrats to the Wayne High School students who participated in the Business Professionals of America Region 3 competition. State competition is March 1Fourth and 1Fifth in Columbus. Top three state finishers will compete in the national BPA competition in Anaheim, California in May.